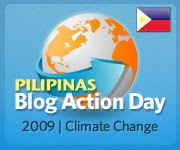 I'm not aware that Oct 15th is Blog Action Day. Thanks for informing us. Btw, yep we must act now to save the environment. Plating a tree is the first thing. \sometimes however, because of our work schedule it's impossible to keep up with that advocacy...The best way perhaps to start is to do waste segregation.. Climate change is a debatable topic but it is not debatable that it has been raining really hard for the past few days. I'm glad we are "awakened." I'm just worried about Filipinos who do not have access to the Internet. NGOs and government agencies must work together to educate these groups of Filipinos who are not aware and informed. you are right of course, there has to be ACTION. Hey man, thanks for your comment and for your vote to my daughter! God bless! I've long been taking action by means of the following: 1) not accumulating unnecessary stuff that contributes to waste and obtaining of plastic containers 2) not littering by throwing trash on designated bins 3) minimizing the hours of use of air conditioning 4) not smoking 5) not staying during unnecessary hours at the office to turn facilities off 6) blogging about #s 1-5... because a person a day can be two persons a day or more. Just imagine if 50 constituents live consciously in a community per day. Oh my goodness... thank you for the reminder! I was just watching the news about that - winter got to some parts of the U.S. much earlier this year causing some damage along the way. Just the simple fact that the leaves hadn't fallen off the trees yet trapped snow on trees causing damage to vehicles and homes along the way. I'm no expert of the subject either but things are changing... the reason is still unknown but again, thank you for the reminder! ...and we just have to expand our awareness, understanding and view of steps an individual can take that have any kind of impact. Some amount of positive impact is always better than none or negative impacts. it seems that climate change is inevitable.. but at least we can delay its effects.. awareness of the problem is important but we need to act immediately if we are to combat global warming.. heat is building up but we are still cold at it. It has been reported that there has been a .61 deg Celsius increase in the atmosphere. So it means more heat, more water evaporated, more waterlogging for the unprepared regions all over the world. And the cause of climate change is practically man-made. i'm not aware about this but yeahhh i'm agree with all the statements! Hi! ill be having a triple medical celebration, hope to see u there!! I failed to make a post that day :( I had to attend to my cousin. I had a promise to her. Anyhow, I may not be able to voice out my support for climate change, but I support it through simple actions.